The pier-side view of Souda Bay during exercise Phoenix Express 2012 (PE12). Image courtesy of US Navy, by Mass Communication Specialist 1st Class Brian A. Goyak. The Military Sealift Command (MSC) roll-on / roll-off ship, USNS Red Cloud (T-AKR 313) off-loads coalition combat equipment and supplies at Souda Bay, after returning from Iraq. Image courtesy of US Navy, by Paul Farley. The Oliver Hazard Perry-Class guided-missile frigate USS De Wert (FFG 45) arrives at Souda Bay for a port visit. Image courtesy of US Navy, by Paul Farley. The Military Sealift Command dry cargo and ammunition ship USNS Lewis and Clark (T-AKE 1) performs a berth shift for refuelling before leaving Souda Bay. Image courtesy of US Navy, by Paul Farley. The aircraft carrier USS Harry S. Truman (CVN 75) departs Souda Harbour after a scheduled port visit. Image courtesy of US Navy, by Paul Farley. A US Air Force E-3 Sentry Airborne Warning and Control System (AWACS) lands at US Naval Support Activity Souda Bay. Image courtesy of US Navy, by Paul Farley. United States Naval Support Activity (NSA) Souda Bay is located at the Hellenic Air Force Base near the village of Mouzouras, 17km east of the city of Hania. The base is strategically located on the north-west coast of the Greek island of Crete. "NSA Souda Bay provides operational support to US, allied and coalition forces within the United States European Command." NSA Souda Bay provides operational support to the US, allied and coalition forces deployed within the United States European Command (EUCOM) / US Central Command (CENTCOM) / US Africa Command (AFRICOM) AOR. It delivers critical logistical support and services to the US and allied ships, as well as aircraft operating in or transiting the eastern Mediterranean. NSA Souda Bay is home to around 750 assigned military and civilian personnel. The base ensures the combat readiness of assigned units, including ships, aircraft and detachments. NSA Souda Bay lies on the circular shaped Akrotiri peninsula. It is spread over an area of about 110 acres on the northern part of the air base. The facility is chunked with the Hellenic Air Force Base. Most of the north and south coast of the Souda Bay harbour is occupied by the Hellenic Naval Base and the port village of Souda. The base is camouflaged by mountain ranges. The US Navy’s presence at Souda Bay was first found in 1957, when Advance Aviation Base (AVB) ship USS Alameda County (AVB 1) was stationed in Souda Bay to support fleet units deployed at this eastern Mediterranean island. "The facility supports joint US Navy and Air Force reconnaissance missions and other joint USN / USAF and multinational operations." US Naval Detachment, Souda Bay was established in May 1969 with a staff of 13 members. It was a detachment of Naval Air Facility Sigonella, Sicily. The detachment accommodated 93 enlisted personnel and three officers by August 1972. Some of the major detachments set up at the time were Mobile Mine Assembly Group Detachment Six, Naval Communication Station, Greece, and Naval Inshore Warfare Task Unit, Europe. The mission of the base was to manage the facilities in support of US Navy units operating in and around the Mediterranean region. The US Navy built a workshop, a sickbay, housing units and supporting utilities in 1973 under a base build-up programme. The US Naval Detachment, Souda Bay was decommissioned and US Naval Support Activity, Souda Bay was set up in October 1980. NSA Souda Bay operates as a Naval Operating Base, Naval Air Station and Naval Weapons Station. The facility supports joint US Navy and Air Force reconnaissance missions and other joint USN / USAF and multinational operations. NSA Souda Bay delivered air refuelling support for various operations, such as Desert Shield / Storm, Enduring Freedom and Iraqi Freedom. It is home to several tenant commands, including Naval Computer and Telecom Area Master Station; Detachment 1, 95th Reconnaissance Squadron, USAF; Naval Munitions Command Detachment; Supply/FISC and American Forces Network Det, Souda Bay. 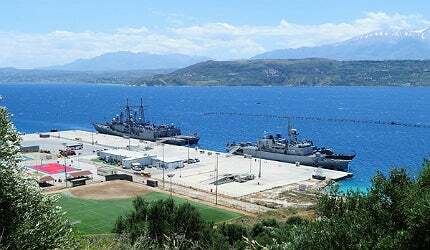 The Nato Maritime Interdiction Operational Training Centre is also located at Souda Bay. NSA Souda Bay provides garrison support for officers, enlisted personnel and US / Local National civilians working in various departments. Souda Bay has wide range of facilities including barracks, a commissary, navy college, navy exchange, a retail service centre, a fleet and family support centre, health clinic, a multipurpose court, fitness centres and gyms. The airfield at Souda Bay also functions as a civilian airport. The airfield has one main concrete paved runway and two parallel taxiways. The runway has a length of 11,738ft and width of 148ft. The south parallel taxiway is 9,850ft long and 72ft wide. NSA Souda Bay Air Terminal offers air travel services for official duty passengers, cargo and Space A passengers through Department of Defense (DoD) aircraft. It accommodates the US Naval European Meteorology and Oceanography Detachment. The Fleet Air Reconnaissance Squadron (VQ) 2 detachment is also based at NSA Souda Bay.